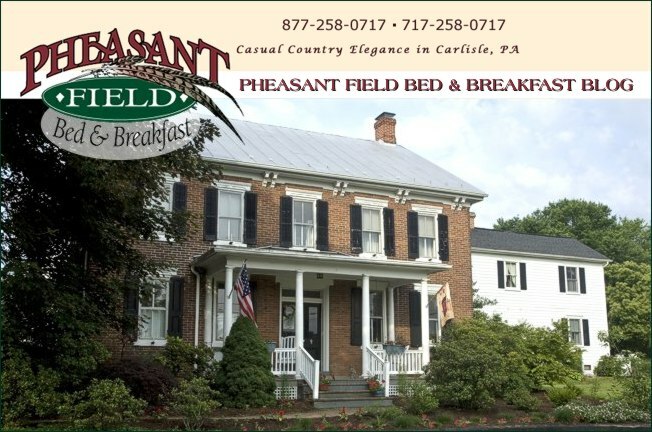 Summer may be winding down - but weddings and receptions are really gearing up here at Pheasant Field B&B. As the humidity lessens at the end of the summer and into the fall, the weather becomes perfect for outdoor events. Every weekend in September we have at least one wedding and/or reception! We will host weddings as small as just 30 guests and as large as 200 attendees! What a special time for us and for the happy couples. We will keep our fingers crossed that we do not have any "liquid sunshine" on these special days - but the tent will take care of that if necessary. Next weekend will be the Corvette Show in Carlisle. Some of our Corvette show folks have been staying with us for 14 years! It's always like a wonderful family reunion when all the Corvette folks arrive. Having all those wonderful machines in our driveway is a lot of fun!